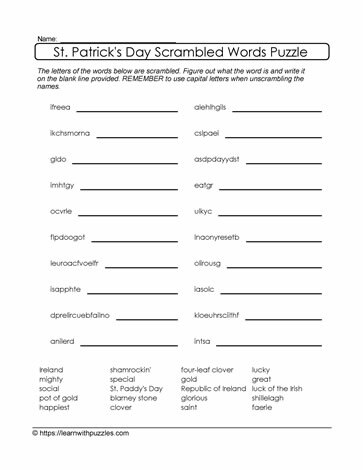 This scrambled letters for St. Patrick's Day engages students' brains and activates problem solving skills as they solve this puzzle using their knowledge of word structure, vocabulary and theme based words. To solve the puzzle rearrange the letters in the two columns of words, using the word bank as a guide. As a further challenge, cover the word bank to see if the scrambled letters can be rearranged without using visual cues. Suitable for students in grades 3,4,5 classrooms, homeschoolers and as a tutoring resource. Great support for theme based activities.